For other places with the same name, see Mendoza (disambiguation). Mendoza is a city in western Argentina, in the desert Cuyo region. Mendoza is the center of the Argentinian wine industry, for which it is world renowned. It is also near the Aconcagua, the highest mountain outside of the Himalayas. Mendoza is the capital of the province of Mendoza. Although it is situated in an extremely dry desert region, Mendoza has an extensive artificial irrigation system, which allows for greenery throughout the city as well as the growth of grapes used to make its wines. Most streets have irrigation channels on either side, with bridges for pedestrian and vehicular traffic. These are periodically flooded with water diverted from the river. The app 80,000 trees and the wide avenues give the city a beautiful ambience, a change from much of the bare feel of many Argentine cities. To the immediate west is the Pre-Cordillera of the Andes towering over the city, with peaks at some of the snow-covered (throughout the year) Andes peaks beyond. Siesta (afternoon nap) is still taken in Mendoza, mostly because of the summer heat. Most businesses close between 12:30 and 13:00, many foodstores do not close until 14:00 The shops then re-open at about 17hs and stay open until 20:30. Supermarkets are usually open 9:00 to 22:00, also on Sundays. Banks are only open Monday through Friday from about 8:00 to 13:00. Casas de cambio (money exchanges) close at 20:00. Summers are hot and dry in the city. January is particularly hot; temperatures of 40°C (104°F) are not uncommon. However, the lack of humidity (and during summer, the many trees) makes both the heat and cool more bearable than, say, humid Buenos Aires. The nearby mountains are cool, though, even in the summer. Winters are moderately cold in the city from late June to late August, and very cold in the mountains. Many ski centers are located near Mendoza (see below "DO"). The large bus terminal is about two kilometers from the city center. Taxis and remis (private taxis) are readily available (US$ 3-4 to the center), or it is a 15 minute walk (not recommended at night, the area between it and the center borders on the red light district). There are daily bus connections to all major destinations including Bariloche and Santiago de Chile, a beautiful 7-hour bus ride crossing the Andes. 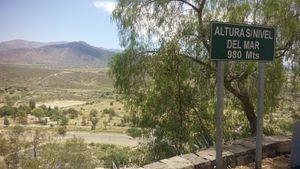 Santiago de Chile is not always reachable by bus as the Andes pass often closes after heavy snowfall in the winter months, normally around late May to early September (but may be stretching until mid October). The pass may then be closed for a couple of days up to a week. Travellers on a strict timetable (upcoming flight, expiring visas, etc) should consider this and not go on the last possible day. The first day after reopening of the pass large queues can be expected at the border checkpoints, adding several hours to the journey time. The joint immigration/customs control for both Chile-out-stamps/Argentina-in-stamps (convenient) for entry into Argentina is located at Los Horcones near Puente del Inca, and the one for entry-into-Chile/exit-from-Argentina stamps is at Las Libertadores in Chile, 5 km past the tunnel (Check the following websites for pass conditions  (Spanish). Mendoza has a small international airport, El Plumerillo (airport code MDZ), with flights to Buenos Aires (LAN and Aeroineas Arg.) and Santiago de Chile (LAN), but tickets are very expensive as compared to bus fares (the fares to Chile are more reasonable, as you do not have to pay the foreigner premium for domestic flights). Flights to Salta, Iguazú and Bariloche have started in the 2010, to and from, on Tuesdays , Thursdays and Saturdays, with Aerolineas Argentinas. From the airport, you can take a remis (a type of taxi) for fixed posted prices (as of late 2014, it was 90 pesos to the centre). There is also a city bus (collectivo) that takes you downtown, but it comes only every 40 minutes and takes an hour to make it's way downtown (exact coins only). Mendoza is a travel hub of sorts for Argentina. If coming from Santiago, you will now have to pay the Argentine reciprocity fees paid by USA and Australia passport holders (if you book your bags through at Santiago, you will not have to pay the similar fees for Chile payable only for entry at the Santiago airport immigration, not for land entry into Chile. As of February 2014, Chile was added to the US Visa Waiver Program and no longer charges a reciprocity fee for entry at any port.). Use the Plataforma10 or the Ticket Online website for almost all long distance bus routes and bus companies. In the winter, the mountain passes to Chile can be closed for several days if weather is bad, but this is only intermittent. Be aware of this when buying a bus ticket. Check here if the tunnel is open or closed: Túnel Internacional Cristo Redentor at Vialidad Provincia Mendoza. Central Mendoza is relatively compact and walkable - for example it is a 20-30 minute walk from Plaza Independencia to Parque San Martin, however to get to the bodegas (vineyards) to the south walking isn't recommended as it they are at least 10km away. A ticket bought in bus or trolley is valid in the other means of communal transportation. Buses are cheap and plentiful, but a little confusing at first. Buses have two numbers, a group (Grupo) number, which is the big number at the top of the front of every bus, and a route number, which is two or three digits (i.e. 33 or 114-115) and is on a small sign behind the windscreen. Buses on the same line (eg Grupo 3) all go to roughly the same place (eg Godoy Cruz) but the route varies by route number - so be careful not to get on the wrong route! Now, you cannot pay cash for bus journeys (Ar$4.00 (2015 MAR) , and it is necessary to purchase a Red Bus card (a prepaid proximity card) that you touch-in when boarding a bus. You can buy a Red Bus card from some kioskos near a bus stop for Ar$5, and charge them up at the same place. An interactive map of the city bus routes can be found on this city website : city bus map. There are 5 trolleys, which are part of the same transport system and have the same price, use the same coin machines and RedBus card. A popular run is the Parque circuit, which takes you to the gates of the large (3.2 sq.km) and green Parque San Martin gates every 10 minutes or so, which you can catch on 9 de Julio , Colon or Aristides Villanueva Streets downtown. At the gates, you could also return by catching the circuit at the same stop. There is also a light train, Metrotranvia, running from the old Mendoza railway station at the corner of Belgrano and Juan B. Justo/Av. Las Heras to the suburb General Gutiérrez, some 15 km southeast of city center. It too uses the general ticket system, and you also you must have a Red Bus card. Information and timetable here: Horarios Metrotranvia. Taxis are plentiful, metered and fairly cheap, costing about the same as in Buenos Aires. A trip across town from the bus station to Parque San Martin will cost around AR$35 (2014 OCT). You can hire bicycles in town - most hostels can put you in touch with a bicycle hire outfit - prices are negotiable (i.e. they will charge you as much as they think you are willing to pay) but you shouldn't pay more than Ar$80 - Ar$100 per day (2014 OCT). You will need some form of ID to leave as deposit. Ask to see and test the bike before handing over your money - many are old clunkers. Parque San Martín. This huge park is nice for walking or biking around. There is also a zoo at the north-west corner of the park with animals in small cages. Behind the zoo begins a path up to Cerro de la Gloria where there is a large statue and nice view over the city and of the mountains - particularly pleasant at sunset. Many bodegas (wineries) offer tours. Wine-tasting events are common; check the culture section of local newspapers or ask around. A good period to visit is during harvesting in March and April. Visiting wineries often requires reservations booked in advance, (Many are closed during weekends). Some major wineries (Norton, Rutini etc.) have regular "walk in tours". Festivals occur often and are usually free. Each has a different theme, and they usually have a stage with singing and dancing and booths that sell food around a plaza. The harvest festival at the end of February is a major event. Many companies organize trekking, expeditions, horseback riding, and whitewater rafting in the desert and the mountains. Mountain cabins in areas with spectacular scenery are easily rentable in the city. Check the classified ads in the newspaper. Campo Base Travel and Adventure, Peatonal Sarmiento 229, Mendoza City, ☎ +54 261 425 5511 ([email protected]), . Trekking-Rafting-Horseriding-Paragliding-Mountainbike-Aconcagua Trekking and Expeditions-High Andes tour-Wine tasting tours. edit Another rafting company above Potreillos (same run) is "Rio Mendoza", and for a more leisurely raft, Betancourt Rafting below the reservoir. Aconcagua - America's highest peak Aconcagua (highest in the world outside the Himalayas) provides trekking and climbing possibilities. All travel agencies and backpacker hostels can organize trips - although a considerably cheaper and more flexible option is to take a Buttini bus to the park from Mendoza's bus station (about 67 ARS one way, Mar 2015). The bus will drop you off at the entrance to by the 20 ARS entry ticket. To catch the bus back, you'll have to walk back to the Puenta de Inca. Probably you would be happy just paying the 20 ARS pesos (Mar 2015) at the park entrance to walk the short interpretive trail and lookout (which will take 45 min), rather than paying the hefty hiking fees past that you need to pay in town at the Provincial Park office in Parque San Martin (depending on how far and how many days you trek). If you want to see the top of Aconcagua, check the weather for the area before going, or you will waste your time and money. Paragliding (parapentes in Spanish) can be done in Mendoza every day of the year, depending on the winds of course. Tours include a tandem flight of about 15 minutes with an experienced pilot. Costs are about 100 US$. There are two companies going off Cerro Arco, both easily googleable: "zonadevuelo" (aka Fly Excursion) and "flyadventure"(aka mendoaventuras). Skiing is popular in the winter, but the season is short. Closest are Penitientes (bigger) and Los Puquios (beginner) on the highway almost to the Chile border. You could either take the Espreso Uspallata milkruns, or by bus tickets or packages from the many agencies on Las Heras Street, between Mitre and Peru streets, where there are also lots of ski equipment and clothes rental shops. Small group and private Wine Tours - The most popular high-end wine tours are Ampora Wine Tours, Uncorking Argentina, and Trout & Wine, which take small groups to better wineries, include better tastings and a multi-course wine pairing lunch. Most of these tours start at around 175 USD, including the lunch. Bike wine tours - The nearby vineyards will let you taste wine if you show genuine interest. It's possible to do a tour by bike, but there are also fully organised tours going from Mendoza. The most popular destination for biking and wine tasting is Maipu, a short bus (numbers 171, 172, 173 or you can catch the Metrotranvia Train (AR$8.50 - Aug 2017) getting off at Gutiérrez (last stop); don't take the white new bus-van Maipu Special service that cost one extra peso and do not stop in the wineries area) or cab ride out of Mendoza. Many outfits rent bikes and provide a map of the standard route, most of them in Urquiza street. Wine & Ride is situated close to the Gutiérrez Train Stop & Bodega Lopez. Do yourself a favor and choose your bike company carefully. For example, Mr. Hugo (ask the driver for the bus stop; it is on your left side) has well maintained bikes for about AR$150-180 (Aug 2017), Orangebikes (next stop after Mr. Hugo, on the left side) offers detailed information about wineries, including prices and discounts. Be aware that some thefts have been reported: put on your backpack and don't place any important items in the bike basket. There are several excellent wineries on the typical route, including Bodega Lopez (free tour & tasting), Cecchin, Bodega La Rural, Tempus Alba, Viña El Cérno, Familia Di Tommaso, and Carinae. Other worthwhile stops on the route are wine shops, such as 'Vinoteca la Botella' where you can taste a range of local wines, olive oil, and even juices for a very reasonable price (around AR$20 each for small groups). As an alternative, Bacchus Wines runs bike tours out of Chacras and will rent bikes for about $40, provide a map and call ahead to several vineyards. Please be careful with your belongings on the bike wine tours, as there have been cases of bags being snatched out of the baskets on bikes recently. Budget from 150 to 300 pesos per person for "tastings", based on visiting between 4 to 6 wineries. Vendimia (Harvest Festival) happens every year at the start of March. Lots of events relating to wine and concerts. Intercultural  is the biggest, has a range of afternoon activities, and is slightly more expensive, Greenfields  (aka COINED) is smaller and feels even less well-organized, but many of the teachers work at both schools. Another great option for individual or very small tailor-made quality group lessons with a highly trained instructor: Spanish in Mendoza, Argentina (SIMA) . This is a better option for those seriously interested in learning or improving their Spanish, although the classes are very enjoyable. Another interesting way to learn Spanish is by sharing accommodation. For people planing to stay for a couple of months, renting a room in a shared place could be the best option. Prices are reasonable low compared to hostels and hotels. The wine is excellent and can be extremely inexpensive, although in terms of quality you most often get what you pay for. There are several wine boutiques which offer wine tasting. In general, you can buy the same bottles of wine at local supermarkets at lower prices. Electronics are imported and thus expensive. There are several mountaineering and trekking equipment shops offering a wide variety of outdoor equipment. A couple of shops are on Av Juan B Justo near Av Belgrano. Leather goods are also readily available and inexpensive. There are many shops on Las Heras Av. Try world-famous Argentinian beef asado (roasted) from a parrilla (grill) restaurant, with a bottle of Mendoza's excellent wine. Beware that they tend to put too much salt in the meat so you cannot really appreciate the taste. Try asking for unsalted steak and then add the desired amount of salt at the table. Mendoza's most famous wine varieties are the Malbecs from Maipú and Luján de Cuyo. Other good options are Cabernet Sauvignons and Merlots. Restaurants offer small wine bottles (375 ml). Even by Argentinian standards, Mendocinans eat late. On weekdays kitchens open around 9PM, but few diners arrive before 10PM. On Fridays and Saturdays things don't get going until 11PM. Tenedor Libres: (literally, free fork) Mendoza has many good buffets that serve reasonably priced lunches and dinners. Most offer 5-10 meat dishes freshly cooked on a giant grill and a variety of side dishes and desserts. The quality of the food can be quite good and it's an excellent way to try a selection of Argentine food. Mendoza is a very liveable city, and many choose to stay for a few weeks to take language courses and the like, there are a number of short term apartment rental companies, concentrated in microcentro (downtown). You'll find several in 'Galería Independencia' in Lavalle street. An internet search will bring up several scores options, if you know that an apartment is called 'departamento'. Be wary of paying deposits before you arrive as the apartment may not live up to your expectations. Traffic noise can be a particular problem. The most pleasant part of town is between Avenida Belgrano and Parque San Martin - La quinta Sección, the richest part of town, with quiet streets and well kept neighborhoods, and the bars and restaurants of Arístides Villanueva within walking distance. East of the centre is the more low rent area, and contains the cheaper hostels. Be warned, the below information appears to be rather out of date and is in need of updating. Jan. 2015: seems to be a serious bedbug infestation going around town. Check reviews before booking. November 2015: Prices below very out of date. Doubles with private bath all tend to be around Ar$380. Casa del Pueblo located 2-3 blocks from the bus station. Great for the price, very helpful staff. The matrimonial room had bedbugs, but we switched to the dorms & were fine. Neighborhood seems dodgy, but feels fairly safe after the first day or so. Cuyum Mapu Hostel Av San Martín 2348, Mendoza. Located right in the center of the city, just seven blocks from the downtown area +54 261 4201147 $10/person/night A cozy, friendly hostel with big rooms, hot water 24/7, and a huge beautiful garden with bbq and pool in an old mansion. It's close to downtown, but on a shady pedestrian street so there is no traffic noise. Punto Urbano nice hostel, centrally located, extremely helpful bilingual staff. Many tours & activities. Breakfast was fantastic. Had bedbugs in the four-bed dorm. Hostel Lagares Corrientes 213 Downtown Mendoza; ten minutes from the bus station and 2 blocks from Ave. San Martin +54-261-4234727 $7.80-$18.20 A very friendly, welcoming hostel with big, bright rooms, each with a full bathroom, thick mattresses, daily cleaning service, lockers, Wi-Fi, breakfast, and large common rooms stocked with fun things to do. Very close to all the downtown restaurants, bars, clubs, shopping, and more. Ruca Potu TRAVEL WARNING: A large man at the bus terminal is very convincing about this hostel. DO NOT GO. If you do expect to have your belongings stolen and to feel sorry for the human race as the owners are dishonest, filthy, disgusting, thieves. The actions of this hostel have been reported to the tourist police on several occasions, they are not to be trifled with. Somehow they are allowed to continue to operate by the local authorities. Do not support there illegal activities DO NOT stay at this hostel. Sheraton Mendoza Hotel, Primitivo de la Reta 989, +54 261 4415500, 5 star hotel. Beware of muggers, especially in the bus terminal and the city blocks surrounding it. As in many countries, be careful of the vehicles. There is no right-of-way-for-pedestrian at crossings and many drivers will not respect stop-signs (only "transit police" are allowed to enforce these laws, not the mostly-visible standard police officers). Intersections are potential death traps, this cannot be emphasized too much, the vehicles are often driven erratically, fast, & without attention, wandering and without signalling. Look everywhere, and make no assumptions. Especially be careful when there is a bus or taxi approaching from any direction. Many pedestrians choose to jaywalk (a crime not enforced enough here yet) in the middle of the block to avoid endangering their lives and limbs at intersections! The transit police, who are actually a separate police force in Mendoza City, Godoy Cruz, Las Heras, Maipu, and Lujan de Cuyo, have consistently enforced and increased fines since 2009, for lack of seat belt usage, headlights not on at all times, and talking on the cell phone while driving. These crimes have diminished greatly. Speeding is still rarely enforced on public roads due primarily to lack of local acceptance of radar gun results but renewed efforts are underway in 2013. Buy your bus tickets out at the terminal or in the street Montevideo, where some larger bus companies have their offices, at least a few days before you leave, especially during the December to March high season, July mid-winter break, and holidays, when bus usage is especially high. This page was last edited on 9 November 2018, at 14:16.